DC Marine was formed in 2008 in order to provide concise and accurate vessel surveys to meet our client’s needs, specialising in all types of yacht and power craft under 24m. Donald Clark is the principle surveyor and has over 30 years experience at sea as a graduate Marine Engineer. Hugely experienced in vessel refitting and repair techniques and he has a considerable portfolio of small craft surveys. He is a Chartered Engineer with the Institute of Marine Engineering, Science and Technology, and has a diploma from Lloyds Academy in Small Craft Surveying. He is an Associate member of the International Institute of Marine Surveyors (IIMS). Along with traditional surveying techniques he uses modern examination processes where required, and engine inspections can be provided. Recent projects have included surveying a steel world circumnavigation yacht, (including hull plate thickness ultra-sonic testing), vessels being commissioned for inland cruising, as well as a great number of pre-purchase and Insurance valuation surveys around West Coast harbours and boatyards. Donald is also a commercially endorsed RYA Yachtmaster, has been involved in boats since his childhood, and his enthusiasm for all sailing activities allows him to understand exactly the needs of the boat owner. 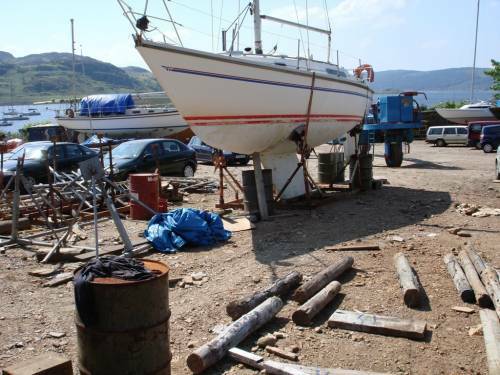 He also runs a 10m converted Motor Fishing Vessel, taking visitors to Argyll on sight seeing trips around the Kyles of Bute. The company carries full PI insurance for yachts and small craft.